This is a recipe from the old twimii, corrected and with a new gluten-free option. 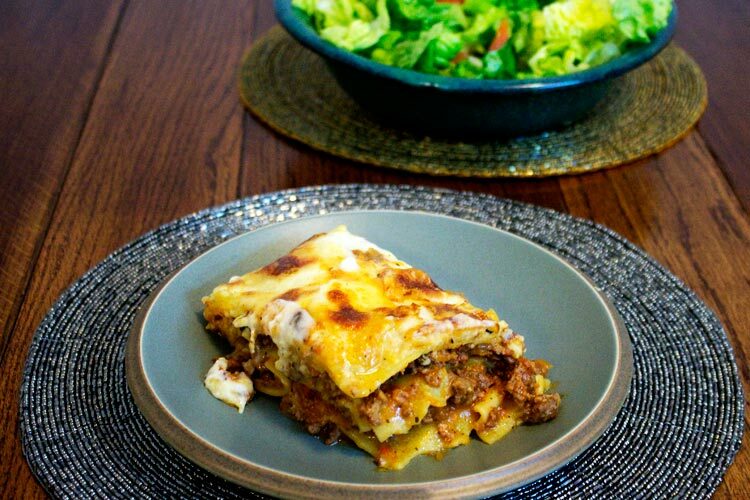 I love this lasagne – I’m so glad I’ve a gf version of it now. Hope you like it too. 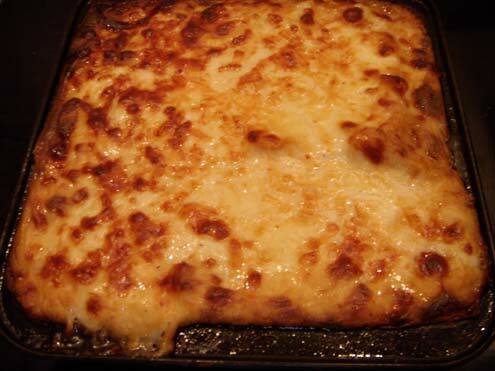 This is an update and correction of the lasagne recipe from the list of old twimii recipes. The filling bit was right, surprisingly, but the quantities I put in for the Bechamel sauce are not – also I started adding a pinch of ground allspice to Bechamel sauces a couple of years ago and I really liked it so that’s something new too. And I add Bechamel sauce to the filling because … because it’s better that way. Anyway I hadn’t had this sort of lasagne since going gluten-free so I decided to try and make a gluten-free version of this by just substituting a gluten-free flour for the white (wheat) flour and gluten-free pasta sheets for the regular ones. It worked very well – and showed me that the filling part of the recipe was right. I know the Bechamel sauce part of the Tomato, Mushroom and Olive Lasagne recipe are correct (all the abitmoreveg recipes are correct) so I’ve just used that here for the regular Bechamel sauce bit. The plugin that I use to show Related Posts generates related posts from other websites that I can see when I am writing/editing posts in the admin part of twimii. The very first related external post that I can see as I type this is titled “Oregano in spag bol? 10 other classic dishes you’ve been cooking all wrong” – Don’t you hate it when auto generated content takes an accusatory tone? Well judgemental plugin, although I imagine this goes without saying, this is not an authentic Italian recipe – a good sign might be that I call it a lasagne and apparently this is actually the plural of the lasagna in Italian, but that’s the way we spell it in this country, for now at least. Another sign would be that post entitled “The old (and often inaccurate) recipes of twimii’s past” – my aim is to record tasty recipes correctly, trying to make sure the recipes are also the ethnically authentic version … it’s a bridge too far. And do you really want me making up my own name for a dish that strongly resembles an existing dish? If you would then I’ll call this Bubblingly Cheesy Tomatoey & Meaty Pasta Pie. Better? I made this lasagne gluten-free by using gluten-free pasta sheets and a gluten free white flour mix instead of plain wheat flour. Works very well. In case you’re wondering if the Spaghetti Bolognese recipe is authentic – I guess this is you’re first time here, welcome! – no it’s not even remotely authentic. I’m not sure exactly how an authentic one would be made but I think proper Spag Bols don’t have veg in them and often are made with a little milk. I guess if I read that article I might find out. I think there’s an authentic recipe in the Ballymaloe Cookery Course book and I think that uses milk. OK I just read the article about what is supposed to be in a proper Spaghetti Bolognese and it doesn’t mention milk. The reason why I was sure that it did was that a few months after coming up with this lasagne – which by the way I love and thought was the best lasagne ever – I had some lasagna that was made by an Italian woman and it was so good, much better than mine and I was a little crestfallen for a bit wondering how come hers tasted so much better than mine. Even though there didn’t seem to be any excess of cheese on it somehow the whole thing, the meat and even the pasta, somehow tasted creamier. It was really really good. Now this lasagna was a gift to a colleague at a place where I was working at that time so I wasn’t able to talk to the woman to find out what she’d done exactly but I guessed that 1) she gave it a longer cooking time at a lower heat and 2) she maybe used some milk in the bolognese part. I decided against doing a whole long stewing bolognese and all that but I did add some of the Bechamel sauce to the meat filling and it did improve the recipe – which I already liked a lot. Is it as good as the Italian one? No. But it is very good. Try it and see for yourself. And you can make this lasagne in about an hour and a quarter. I started the original recipe saying DO NOT ADD SALT and this is still true for the filling and for the regular Bechamel but for some reason if you’re using gluten-free flour – or least the blend I used – you need to add a pinch of salt to the Bechamel sauce. If you are using a plain white gluten-free flour mix make sure it doesn’t contain xanthan gum because it’s not needed for this recipe. Oh also, I don’t add Parmesan anymore – I prefer the taste here with just the Mozzarella and the Bechamel sauce. Onion, carrot, celery, minced beef, unsmoked rashers, tinned tomatoes, dried basil, garlic, tomato purée, red wine, pasta sheets, whole milk, salted butter, nutmeg, ground allspice and white flour. Roughly chop the onion, carrot and celery, and mix in blender to a mince consistency. In a large heavy saucepan or frying pan heat a little olive oil. Add minced carrot, celery and onion to the pan, cover and leave to sweat on a gentle heat for 5 minutes. Meanwhile remove some of the fat from the rashers chop up roughly, add to the blender and mix to a mince consistency. 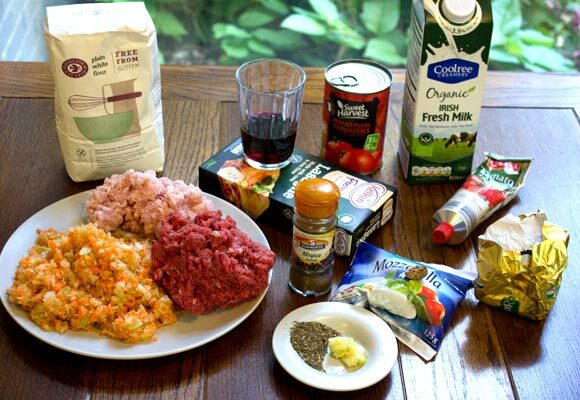 Mix together the beef and rasher mince. Make a clearing in the centre of the pan, turn up the heat and add the meat one handful at a time, stirring around and adding another handful just as the meat turns brown. When all the meat is added, stir around mixing well together with the veg. Add the tinned tomatoes and break up them up with a spoon. Stir in basil and garlic. Stir in the wine and tomato purée, and leave to boil on high for a couple of minutes then reduce the heat and simmer for 25 minutes. Melt the butter in a saucepan on a gentle heat. This will only take a couple of minutes. Be careful not to let the butter burn. Once the butter is melted, add the flour, nutmeg and allspice. Stir in well to a smooth consistency. This butter-flour blend is called a roux and it is the base of many sauces. Cook the roux on a gentle heat for a further 2-3 minutes, stirring continuously to ensure it doesn't burn. This is to ensure that the flour is completely cooked, otherwise your sauce can taste a little floury or doughy. Add 3 - 4 tablespoons of the white sauce to the meat filling, stir in well and leave to simmer for a couple more minutes. Grease a lasagne dish with a little olive oil. Add a layer of pasta sheets and cover with a generous layer of the filling. Carry on until you have used up all the filling (there should be plenty for 3 layers) cover with a final layer of pasta sheets. Pour the Bechamel sauce over the pasta and top with either sliced or grated mozzarella cheese. Bake in a pre-heated oven at 180 C until the top is golden brown and blistering. When ready remove from the oven and leave to cool for at least 15 minutes so the white sauce will have set a little and you'll have better looking portions. Shot at night so the lighting isn’t the best. 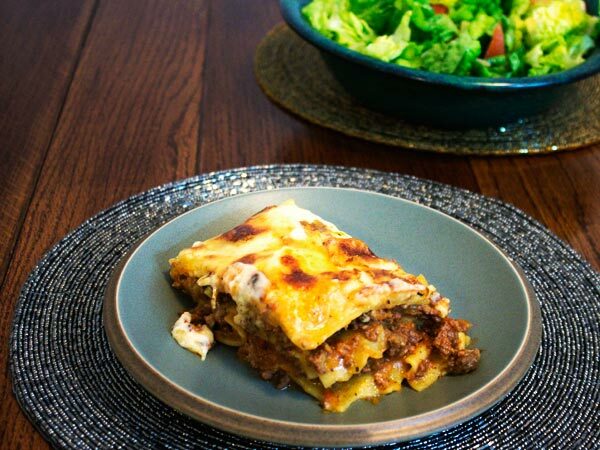 But however it looks it tastes great – lasagne and salad.